How to use Facial Recognition? The Facial Recognition Power-Up allows you to verify if everyone that jibbles in/out of the system using a selfie, is actually who they say they are. It's a great measure to prevent the phenomenon known as "buddy punching" and leaves very little room for error. To activate Facial Recognition go to: Power-Ups menu -> Facial Recognition -> Enable. Facial Recognition is now enabled for all your team members. This is where every team member or the admin/owner needs to set the baseline photo for the member. The best way is to select a previous time entry. But to do this your staff members will need to submit at least one selfie, which is the recommended method. The other way is to upload new photos but you'd need access to all the photos on your desktop. Note that Facial Recognition only works when there is a baseline photo that is used to compare new entries with. It is advised to use clear, well lit photographs, from a front facing position and ensure they are taken as selfies. That's all, your staff can jibble in/out with their selfies as usual without any changes. There is more than enough lighting available when the photo is taken. Facial recognition will have difficulties making distinctions when it's darker. The angle used is always the same (ideally front facing). Your staff doesn't wear any hats/caps. You can simply click "View Daily Timesheet" to see when this occurred (make sure you're logged in). 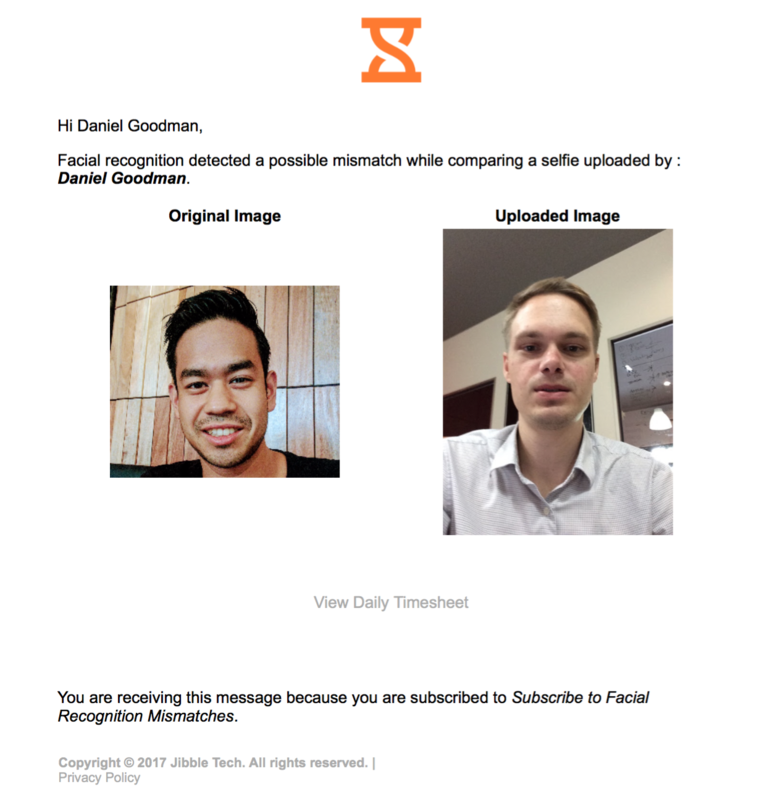 Note: Facial Recognition is based on percentages of similarity and therefore never 100% accurate so make sure to always double check the time entries when receiving these e-mails. You could receive unwarranted mismatches with selfies that have darker skin tone photos or dark lighting, but as the facial recognition improves over the months this shortcoming will be overcome.